The above photo was taken this morning as I was getting ready to leave my apartment to goto work. You can't even see the school building in the background!!! 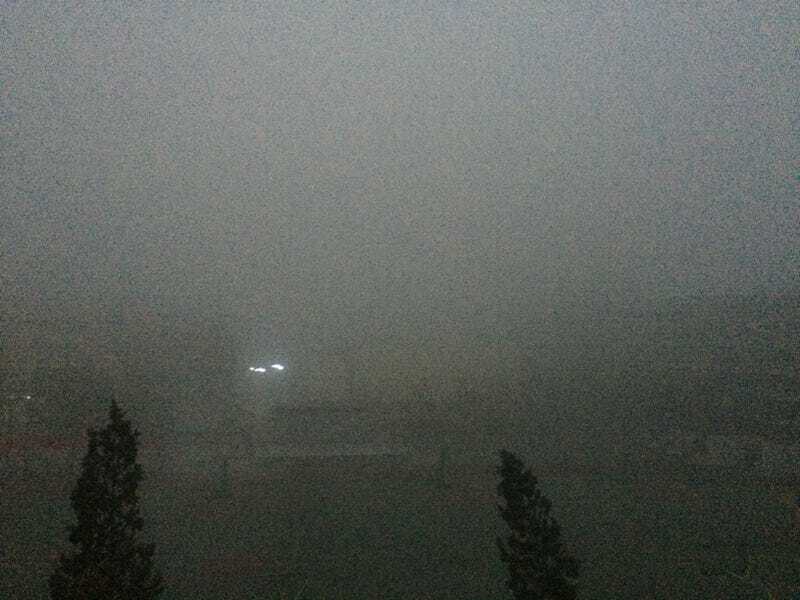 Keep in mind, this photo was taken round 6 am so it's still dark, but as the day went on (as of this writing, it's 10am China Time) it still hasn't gotten better. For those of you who don't know, I'm Kotaku's China guy. I live in this smog filled city known as Beijing, the capital of China. Since 2012 the air quality in Beijing has been on a steep decline. This kind of pollution isn't all the time! It's not even most of the time. Cumulatively it probably appears 1/4 of the year. Last year, the smog hit a particularly high level and the term "Airpocolypse" was coined. This kind of air pollution is particularly scary as it involves something called P.M.2.5 or particulate matter smaller than 2.5 microns. This is the kind of crap that your lungs can't really filter. China's State media has even admitted that this air pollution is slowly killing it's citizens. While State media has acknowledged the smog as a problem, it only does so when the pollution is extra bad. On a regular basis, this is kind of scene is called "FOG!" GTFOH. This is not Fog. It's terrible. It hurts to breathe T-T. That said, the other 3/4s of the year are okay. Now before anyone gets the idea to tell me that I need to GTFO, I already know that. Unfortunately work is what keeps me in Beijing. Life here isn't bad. It's just that the air pollution is oppressive and makes it annoying. Beijing is a city everyone should visit at least once, come in August, or April the two months with the least smog and the best weather. Look me up while you're here, I'll buy the first beer.